Next Wednesday is Ash Wednesday. It is one of the services of the church year children are least likely to attend. That is unfortunate because there are three big reasons for them to be there. U When children see all the adults they love and respect wearing ashes and they themselves are marked with ashes, they know they belong. They are one of God’s people. Other days they may know that with their minds, but on Ash Wednesday they know it in a powerful way with their eyes. U Because we are all marked not with golden markers but with messy black ashes, children learn that all of us mess up and are forgiven. The most loved and respected adult they know does and they do. In a world where they are constantly told they can do better and can make good choices and should be special, this is important life-shaping information. U After experiencing an Ash Wednesday service, especially one in which the presence of children is planned for, children and their families are more likely to come back for holy week services to worship around the most important stories of our faith. Last year, I mentioned planning my children's sermon for Ash Wednesday, and another pastor asked why we would have a time for children when there wouldn't be many there. As it turned out, the congregation was almost 50% kids under age 10. I was sure glad I had something planned for them! Good for you! I suspect that worship leaders communicate more than we intend to about our expectations for worship attendance. When families with children know they are valued and welcome and the services are planned at times that work for them, they show up and worship. We are planning an Ash Wednesday chapel in preschool next Wednesday. 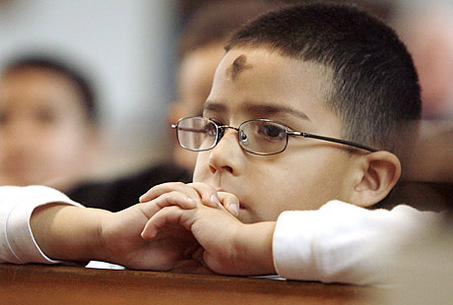 Can anyone share ways to involve children in ash Wednesday services in a manner that they will understand? ?